Joanna Ruszala is a Polish soprano who has won international competitions and performed roles including Violetta, Mimi, Marguerite, Liu, Micaela, Aida and Tosca. She made her American debut as Donna Anna in Don Giovanni at the Arbor Opera Theater in Michigan ten years ago. Most recently she appeared in Verdi’s Aida with Teatro Lirico di Europa singing the title role. She has also sung Tosca with the same company. Additionally, she made her debut with the New York City Opera in the production of Telemann’s Orpheus, where the New York Times named her “The Winning Soprano”. Joanna has performed numerous oratorios and masses such as Mozart’s C Major and C Minor Masses, Mendelsohn’s Elijah and Lobgesang, Villa-Lobos’ Bachianas Brasileiras, as well as Respighi’s Il Tramonto with the world renown Silesian String Quartet. She is passionate about her native Polish music, specializing in the works of Chopin, Paderewski, and Szymanowski. She has toured Lithuania, Ukraine, Italy and the Czech Republic in ‘goodwill tours’ dedicated to sharing the works of Polish Composers. Recently she is completing “The Polish Art Song Anthology for American Singers” with her husband, Piotr Wisniewski. She is the winner of the 8th International Ada Sari Competition of Vocal Art in Nowy Sacz Poland, where she won “Outstanding Soprano”; the Duszniki Zdrój Music Competition (Poland); the Katowice Vocal Competition (Poland) where she received a special prize from the Artistic Director of the Silesian Philharmonic; the Bain’s Scholarship for Outstanding Opera Singers from Indiana University; and the Kosciuszko Foundation’s Scholarship in New York. Apart from her career as a performer, Joanna is an active teacher of singing leading a very successful private voice studio. 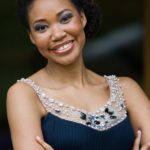 Her students have won international awards including the District Metropolitan Opera Competition and Ezio Pinza Scholarship for American Singers, and have gained admittance to top graduate schools. Additionally, she has worked as a professor of voice for the past six seasons with the OperaMaya International Music Festival in Mexico, and as voice clinician/masterclass teacher in various universities in USA and Poland. Her musical education began in her native Poland where she received a Master of Music degree from Karol Szymanowski Academy of Music in Katowice, whereupon her graduation, Joanna became a professor of voice and served for five years. Following her passion for performance, she continued her musical education at IU Jacobs School of Music where she received a Performer Diploma in Voice along with a Performer’s Certificate in recognition of Outstanding Musical Performance in Voice. Throughout her education, she mastered her skills with Helena Lazarska (Vienna), Christian Elsner (Dresden), Kaludi Kaludov (Varna), Virginia Zeani (USA), Teresa Kubiak (USA), and Carol Vaness (USA).